Closing day is the day when all the parts of buying and selling a home come together. Each party’s lawyer will have successfully completed the details required to ensure all legal aspects are covered. On this day, you will take possession of the home, get the keys and perhaps even move in. It is also a busy time for the seller, as they will likely be in the midst of moving. However, before that day arrives, there are closing details to complete to ensure the smooth transfer of the property. A lawyer represents your interests, and ensures that the legal documentation is properly completed. Your lawyer receives a copy of the offer. He or she reviews the conditions of the sale, the contract and the information for title transfer and registration. Every condition on the offer must be met by closing date. 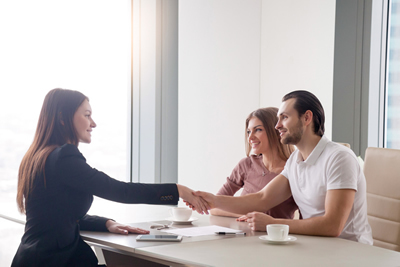 It is your lawyer’s responsibility to search the title of the property (at the registry office) to ensure that the home is purchased without any legal problems and that there are no liens on the home or the personal property of the seller that forms part of the agreement. Your lawyer also needs to contact the municipality for taxes, zoning compliance (permits, use, setbacks, pool, fencing, compliance with subdivision agreements, etc.) and public utilities (hydro, gas, etc.) within the time stated in the offer, to ensure that no taxes are outstanding and the home meets with established guidelines. Preparing a statement of adjustment is also part of your lawyer’s duties. This confirms the selling price, adjustments and the balance (less the deposit you provided with the offer). The lending institution will also draw up a certified cheque for your lawyer to be held in trust. With the purchase price of a resale home, the closing is always “subject to usual adjustments.” This means that any amount that the seller has already prepaid will be adjusted so that the home buyer pays the excess amount back to the seller and vice versa. These adjustments can include: municipal property and school taxes, monthly condominium maintenance fees, first and last month's rental for rental properties that may be in the home, utilities, such as hydro and water including GST. Your lawyer will prepare a statement of these settlement charges. Your lender requires an up-to-date land survey. This document records the location of the home on the lot as prepared by a certified land surveyor. It records any changes to the exterior of the home since construction. Any additions such a deck or building additions could affect your taxes, property assessments and zoning restrictions. If a home inspection was part of the conditions, it should be completed by the date specified in the contract. You should also be satisfied with the report, and any repairs requested as a result of the report results. If you were planning to purchase a resale car, you would want to avoid the headaches of choosing a lemon. You would most likely have it inspected by a mechanical service or a mechanic you know. When you are purchasing a home, why take a chance on unexpected headaches and money? You will want to make a careful tour of the home, not only yourself, but with a professional inspector. Spending $400-600 is money well spent, as the inspector will conduct a thorough inspection of the home, and provide you with a report detailing any potential problems. Based on workmanship, average length of time for operating efficiency, the inspector can give you a good idea of the condition of mechanical items of the home and repair costs down the road. An inspector will not pass or fail the home. Rather, he will give you an unbiased opinion of its condition. Financial details should be finalized and ready for implementation on the closing date. Contact utility, cable and phone companies to ensure connections are in place on your moving day. Update your insurance policy so coverage begins on your new home and property upon closing. Your lawyer also needs a copy of the policy before closing. On closing day your lawyer pays the vendor, registers the home in your name and delivers the title and keys. Be sure you have all the keys, including side door, garage door, shed, mailbox, garage door opener, etc. You may want to change the locks or have them re-keyed.